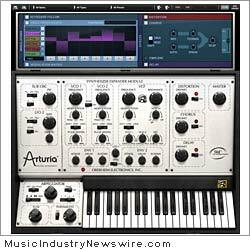 Grenoble, France (MuseWire) – Ahead of the official release, planned for December 2011, Arturia has exposed the detailed features, graphic interface and the first exclusive sound demos on its website. Not only the Oberheim SEM V, powered by the latest innovations in Arturia’s TAE(R) technology, is a faithful “recreation of the original,” but it will also benefit from polyphony, 8 voice multitimbrality and new innovative modules such as the Voice Programmer, the Advanced Keyboard Follow and a Modulation Matrix. Check out the Arturia website www.arturia.com for more information. MSRP : USD 249.00 / EURO 229.00 – Shipping December 2011. As of Oct. 27, 2011, two audio demos have been posted (“Berlin Berlin” and “pad Filter Sweep”), but video has not yet been posted. * Compatible with Windows (XP/Vista/Seven 32 bit and 64 bit), Mac OS X (Mac OS X 10.5 or higher, Intel only).